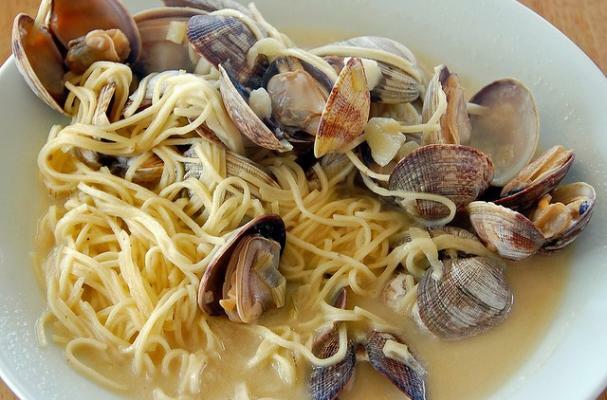 Spaghetti alle Vongole or spaghetti with clams is the perfect end-of-summer meal. This pasta dish is made by steaming fresh clams with garlic and olive oil (a little white wine wouldn't hurt either) and tossed with delicate strands of spaghetti. A few shavings of parmesan cheese and sprinkling of parsley is all you need to finish this light Italian meal. In a large pot, boil spaghetti in salted water according to package directions. In another small pot, heat the olive oil over medium heat. Add the garlic and saute until the garlic begins to sizzle. Add the clams and juice, and simmer to heat through. When the pasta is "al dente," drain and return to the large pot. Add the clam sauce, grated cheese, and black pepper, and serve immediately. Not to be too picky, but you would never find cheese in a clam sauce in Italy. It is also curious that your picture is of a dish made with fresh clams, which are not present in your recipe. Yes, cooking and eating are a matter of personal preference but there are some items that are either true or not true. For instance, I could choose to simmer chunks of lamb in my "Bouillabaisse" but I would be hard pressed to call it Bouillabaisse thereafter without it being inaccurate. People are welcome to put anything they want to in their clam sauce but once you put cheese in it, it ceases to be real Italian food, even if it is Italian cheese. As chefs, I believe one of our jobs is to educate and elevate the palates of those we are fortunate enough to interact with. When we spread inaccurate information and misrepresent the culinary and cultural heritage of food we are doing the opposite. Quit taking yourself so seriously Daniel. Not once is this recipe referred to as authentic Italian. I've tried it with fresh clams and canned clams (and cheese) and it was great both ways. And I'm an exec chef at a Michelin rated restaurant. Lighten up and let others enjoy the simplicity of this recipe. Rod, congratulations on your successful career. I stand by my comments that the history, heritage, and authenticity of food should be respected. Best of luck to you in the future.